Institches with Bonnie: My Stashbusting Downfall! Saturday morning the gals left the guys to go to Capital Quilts. (They were just going to Home Depot to order new kitchen cabinets and counter tops for Jen and Brian.) Capital Quilts is a lovely shop and while there, Jenny and I decided to assist the economy. 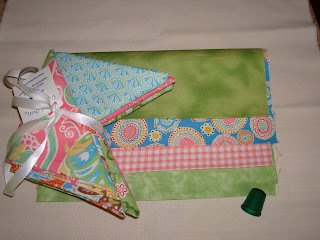 Jenny bought a backing and another fabric for her square in a square king size quilt. She is really plugging away on it. I bought some fabric to use on the Bunny Hill Designs block of the month. I wasn't going to do it right away but I keep seeing all these cute finished blocks on people's blog and... well, I'm tired of my scrap quilts right now. So, I got new fabric for the bom. I also bought one of those cute rubber (?) or plastic (?) thimbles. And the best news is Capital Quilts is only about 15 minutes away from Jen's house. Or 30 minutes in awful traffic! I also want to let you know of a give away over at Silver Thimble Talk. Pat is giving away a lovely selection of prizes including a layer cake, a jelly roll, thread, patterns and a surprise she isn't revealing yet. Stop by and comment on her May 21st blog. Tell her you saw it at Institches with Bonnie. (of course, I will be winning something wonderful so don't get your hopes up too high -- just kidding! But I do hope I win!) She also has a recipe for Salsa that sounds great. This morning it took me a couple of hours to get the first Bunny Hill BOM (which is actually block 2) ready to hand applique. Yikes. I thought I was very clever on the basket handle but I may try a different method on the next one! As soon as it is stitched I'll share it with you. I'm heading back to Maryland on Friday and hope to have several baskets ready to hand stitch and at least one binding on a quilt hot off the soon to be delivered Nolting! love the fabric you purchased! like I need more myself? I do buy some things I like, just not as much as before this year.. as for my pincushion, it is working well. I am going to have him make me a strawberry and fill with sand, I told him he could sell things on Etsy. maybe, making money from handwork might excite him. have a safe trip to Md.